When you’re looking for fab gifts for 1 year old toddlers, you might be wondering where to start. With such a wide choice available, it can be confusing. Check out our extensive list of some of the best gifts around: from ride-ons to dine-ins, and bath time to music time, we’ve got the best ideas here. Gear up for some awesome animal fun with the VTech GearZooz Roll & Roar Animal Train, the perfect gift for 1 year old animal lovers who love to explore. With 15 interchangeable gears, little ones can learn about animals, colors, and even musical instruments as they mix and match the colorful parts. Learning about the alphabet can be a real puzzle to young scholars, but this traditional wooden name puzzle will really give them a head start. Each letter-shaped space is color-coded to its corresponding letter for easier matching, and the board can also be customized with a message underneath, such as date and time of birth. This finger puppet set is one of many wonderful gifts for little ones available from Personalization Mall. The plush house can be personalized with your choice of name, and comes with four adorable finger puppet animals, including a frog, bunny, and lamb, all of which can be stored in the windowed house. Step into Elmo’s world with this super-duper backpack and accessories for tiny tots. The colorful bag comes in a fabulous Elmo design and features touch and close fasteners, keeping the contents safe and secure. Accessories include Dorothy’s fish bowl squeaker, Smarties rattle phone, Schooled dog sound toy, and a crinkle crayon toy. Suitable for all ages. Gifts for 1 year olds don’t always have to be toys – sometimes it’s nice to give something they can look back on in later years. These personalized height charts are just such gifts. Available in blue, pink, or tan, these canvas charts measure from 24” to 57”, and make beautiful keepsakes as they grow. The vibrant colors on this VTech Go! Go! Smart Wheels Playset will attract young ones like moths to a flame! With 2 courses and 4 levels, the SmartPoint van included will take your toddler on a journey of discovery as it travels through the six interactive SmartPoint locations to trigger the happy songs, sounds, and phrases. Not only has Elmo got extra-long limbs for portability, but those lengthy arms also mean bigger cuddles! Smiling all over his gorgeous fuzzy face, Elmo measures 12 inches in height, and features a soft, plush finish making him one of those gifts for young (or old) Sesame Street fans you just can’t resist. Bamboo is an environmentally friendly alternative to paper or plastic plates, and even china, as it is completely biodegradable. Useful gifts for 1 year old toddlers can be hard to come by, but this divided plate, bowl, cup and cutlery set, featuring fruit and vegetable illustrations, really fits the bill. Lightweight, fresh, fun, and functional. Squishies are big news for such a small item, but they’re so much fun! This pack of 20 mostly bakery items (with a few pandas thrown in), are cream scented and make great sensory toys – just squish them hard and watch them slowly rise again. ‘Kawaii’ settle for something less exciting? Non-toxic and safe. Gifts for 1 year old Disney fans don’t come much cuter than this! Neighbors Mickey and Minnie’s houses hold lots of interactive fun for curious tots. With opening doors, press-able teapots, mailbox (with letter inside) and even a spinning weathervane, these BFFs also enjoy regular visits from Pluto, when he’s not snoring in the doghouse. Every day is like a birthday to a toddler, with so much to learn and discover, so let them have their own pretend birthday cake with this fab toy. Count the candles as they light up, blow them out again, and even hear the birthday song every time the balloon is pressed. For ages 12m+. Ready for any sports eventuality, My First Sports Bag comes with four different balls for every little leaguer. The baseball, basketball, football, and soccer ball all contain a different sound, and come in a soft plush finish, while the bag itself can be personalized with your choice of name in one of 13 colored threads. A favorite babyhood game, Peek-a-boo still enchants babies and toddlers today. Let Elmo take over – he never tires of playing, and makes a beautiful gift for 1 year old peek-a-boo enthusiasts. Hiding behind his soft blue blanket, Elmo will peek out, saying one of 13 phrases, along with his famous giggle. Batteries included for out-of-the-box fun. This Melissa and Doug activity bag is the shape of things to come. Double sided, toddlers can push the 9 shaped blocks through their corresponding holes, or turn the bag over to lift the brightly decorated flaps to reveal the shapes underneath. With a dog-themed zipper, and carrying handle, it’s perfect for tots on the go. Whether your 1 year old is in a high chair or sitting on the floor, they will adore playing with the Infantino Pat and Play Water Mat. This beautiful toy is BPA free, and uses vibrantly colored, cheerful sea creatures to captivate youngsters as they pat the mat to make them ‘swim’ in the water enclosed. Make tub-time tug-time! The perfect gift for 1 year old bathing rebels, this environmentally-friendly tug boat is made from recycled milk containers, and thanks to the fun scoop-and-pour design, you can wave goodbye to hair-washing tantrums. Beautifully vibrant, it comes with a ladder, life preserver, anchor, lights, and horns to make playtime even more authentic. Give your toddler the Yookidoo Flow N Fill Spout and fill their bath with laughter. With a strong suction cap, this interactive bath toy attaches to the bath, allowing water babies to watch as the water is drawn up from the tub, and flows from the spout into one (or all) of the different tumblers. Keep toys neat and tidy with a personalized toy box from Personalization Mall. Measuring 30 1/2″L X 18″W X 19 1/2″H, this beautiful box can be printed with your child’s name in one of three fonts, and is available in a variety of colors. Fitted with a safety hinge to protect little fingers. Press the button to open the barn, and step inside the wonderful world of Farmer Jed and his animals. Toddlers can help feed the animals, rotate the corn, and even have fun in the hayloft, before helping the animals settle down for a good night’s sleep. Farmer Jed and four animal figures included. The VTech Touch & Swipe Baby Phone is the ideal gift for 1 year old toddlers who want to be just like Mom and Dad. With 12 light-up ‘apps’, and a swipe screen, this gorgeous gadget allows storage of one number for easy ‘calling’, along with a calendar, clock, and weather ‘apps’ for realistic play. Toddlers will be bowled over with this fun game of tenpin bowling. Each of the ten soft foam pins are numbered, giving baby bowlers a head start in number recognition, while the two soft foam balls are light enough for tiny hands to carry, but strong enough to start perfecting those strikes, spares, and turkey buzzards. Try a xylophone for your mini musicians, and they won’t be able to compose themselves. They will love the clear sound of the eight brightly colored metal keys as they strike them with the two wooden mallets included, and the bonus eagle whistle which comes with it will be a real feather in their musical nests. Featuring 75 songs and sounds, the VTech Sort & Discover Activity Cube will keep your tiny tots amused for hours. With seven activities, including colors, numbers, music, and animals, plus two electronic panels, this toy has enough lights, spinners, pages, and shape sorters to exhaust even the most curious of toddlers. Suitable for ages 9m+. One of the hottest gifts for 1 year old wannabe fire fighters, the Fisher-Price Little People Lift ‘n Lower Fire Truck is a dream come true. With a moveable ladder, fire hose, lights, and more than 25 sounds, songs, and phrases, this tot sized truck comes with two fire fighters and their little dog mascot. Let your toddler dig into their food with a construction site plate and building equipment cutlery, for mealtime memories that will last. The plate is divided into sections, with spaces for the heavy plant machinery utensils, such as the forklift and bulldozer (sold separately), and both come in hi-vis colors for realistic foodie fun. 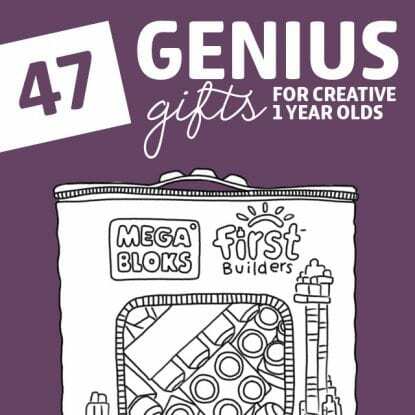 Mega Bloks make mega gifts for 1 year old toddlers who love to build. With 80 perfectly sized pieces designed for smaller hands, your junior architect can build weird and wonderful creations in a rainbow of colors, then take it apart and do it all again. Endless fun for ages 12m+. It’s not just the wheels on the bus that are going round and round, this Ferris wheel is at it too! This beautiful VTech toy features happy animals which teach colors, numbers, and animal names when pressed, flashing lights, suction fastening underneath, and over 45 phrases and songs (including singalongs) to keep kids entertained. These cool Crayola glitter paints are excellent for your pint sized Picasso’s early works of art. In six brilliant colors, these non-crack paints are infused with gorgeous glitter for a picture which really sparkles. Non toxic and washable, these paints won’t stain hands or clothes, and make excellent finger paints, too. Start your own little Einstein off on the road to multilingual excellence with the Baby Einstein Discovering Music Activity Table. With two play modes – music, and discovery – this table will teach your little linguist colors and numbers in English, Spanish, and French. With lights, drums, and melodies, it’s as easy as one, dos, trois! Among the best gifts for 1 year old toddlers are those which have stood the test of time. This barn shaped See ‘n Say toy will teach tots fun facts about 16 different animals, as they start the fun by choosing a page, turning the arrow, and pulling the lever. With quiz mode and music. Babies and books should go together – after all, you’re never too young for storytime. But books are delicate, and babies are less so, especially when it comes to paper. These indestructible books solve the problem. The five classic nursery rhyme books are completely baby-proofed and washable, and beautifully, brightly illustrated for maximum interest. Head down to the park for a picnic with the adorable LeapFrog Shapes And Sharing Picnic Basket. This beautiful gift for 1 year old boys and girls is filled with stacking, sorting, and matching fun, sound effects and music, not to mention the sheer joy of emptying it out and filling it up again! Get some Little Squirts for your little squirt, and fill your bathroom with giggles as well as bubbles. With 10 adorable water themed characters, including an octopus, shark, penguin, turtle, and dolphin, these toddler sized toys can be filled with water before being squeezed to unleash a stream of water and laughter. You can’t fit a square peg into a round hole, but you can fit a whole lot of fun into a square shape-sorter! Melissa and Doug make classic gifts for children of all ages, and this wooden shape-sorter will keep toddlers amused for hours, as they fit the 12 vibrantly colored shapes into their corresponding holes. Hammer home the idea that DIY is fun when it’s done toddler style, with this adorable deluxe workshop. 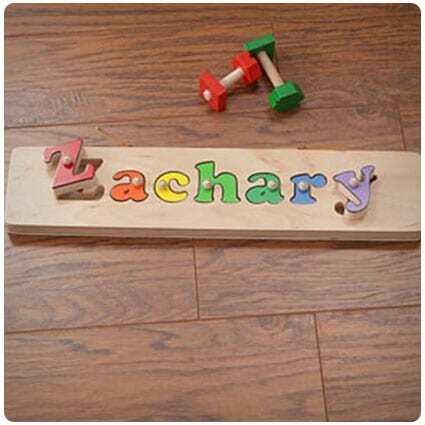 With light up power tools and cool sound effects, this bench will teach kids letters, numbers, and shapes, as well as tune their fine motor skills as they set to work with the toddler sized tools. Nothing says childhood more than swinging in the garden – those long lazy summer days spent daydreaming as the world sways gently past. Swings make great gifts for summer time birthdays, and this Little Tikes 2-in-1 is perfect as it holds them securely in place, and adapts as they outgrow the T-bar and straps, which store underneath. Pull and Go cars are ideal gifts for 1 year old babies on the move, and Melissa and Doug have brought out four of them. Each one (including a police car and fire truck) features a kind-to-baby soft body, and can be pulled back, released, and let go, encouraging crawlers and toddlers to go after it. Hatch and match these adorable little chicks from Tomy, and your toddler will be in for a cracking time! Inside the carton your little one will find six eggs, with colorful expressions on the shells, which can be hatched to match the eggs to their own specially shaped place in the box. As your little one cruises into their second year, let them cruise in style in the Step2 Whisper Ride II Ride on Push Car. This stylish ride comes in a bright blue, and features three cup holders (there’s one for mom or dad), seat belt, storage, and ‘whisper ride’ wheels for the smoothest journeys ever. Say hello to BeatBo, the cutest little gift for any 1 year old who loves to dance! Press on BeatBo’s tummy or his feet to activate songs, dance moves, and learning and games, and choose from three play modes such as Freeze Dance, and Dance ‘n’ Move, for even more fun and funkiness. Spark their imagination with a Spark Kitchen Sink. Just like Mommy or Daddy, your toddler can have a real working sink with a faucet that really flows with water! Complete with plates, cups, cutlery and more, this superb sink is perfect for role playing and doing pretend chores without risking your own best china! There’s nothing remotely dull about this toy, and gadget-giddy tots will love it! Shaped like a real remote, this LeapFrog version is preloaded with more than 65 songs and sounds, vivid colors and flashing lights, and is perfect for helping toddlers with color, shape, and number recognition. For ages 6m to 3 years. For a gift that’s mer-made for little bathing beauties, this adorable Enchanted Mermaid Baby Bath set is the perfect fin. With a hooded towel, spa slippers, and a super cute mermaid bath mitt, this set features an appliqued mermaid on the hood, and can be personalized in any of 15 thread colors, and 9 fonts. With six colors and seven songs, this LeapFrog Musical Rainbow Tea Set makes a tea-mendous gift for any 1 year old. With realistic tea ‘gurgling’ sound effects, and a clear window to view the tea ‘sloshing’ around, this adorable set teaches numbers, colors, matching, manners and more through the 50+ songs and sounds. The perfect gift for your little speed demons, this remote control cartoon car means they don’t have to miss out on the RC fun. With a removable driver, this adorable car comes with fun honking sounds, music, and even flashing headlights for when other toys get in the way, and will drive forwards or reverse/turn. Laptops are an integral part of our lives, and this versatile little version from VTech lets tiny techs get in on the action. With three play modes, toddlers can choose from music, shapes, or animals for interactive learning, and can activate more than 115 songs, tunes, and sounds to enhance their experience. For ages 6m+. As parents, one of our jobs is to make sure our kids feel loved. “I Love You So…” is a beautiful book which can be personalized with your child’s name, so each page ‘speaks’ directly to them. With 28 pages inside the hardcover, this heart-warming story also comes with a personalized dedication message. He shoots…he scores! Or she, because this VTech Smart Shots Sports Center is suitable for boys and girls. Loaded with encouragement, each goal or hoop scored activates a plethora of cheers and positive phrases, and with both basketball and soccer, this center also comes with 50+ learning songs and phrases, plus shapes and numbers activities. My Little Pony is a much loved collection of whimsical characters which come in beautiful colors, and with magical powers. This set of 12 minifigures contains some of the best loved ponies, and are perfect for cake toppers, favors at a My Little Pony party, or even as ‘rewards’ for doing chores. Make learning more eggciting with the Color Matching Egg Set. Stored in a bright yellow carton, these 12 eggs come in two halves, each one color coded and numbered, meaning they are perfect for both color and number recognition. Manual dexterity and fine motor skills will also be strengthened as tots fit the halves together. Whether on bottoms or feet, little ones will find a wealth of learning in the VTech Sit-to-Stand Learning Walker. The activity center can be used on the floor, with its piano keys, spinners, shape sorters and lights, or attached to the walker for mobile fun and learning. With over 70 songs and phrases for every stage. For child powered fun, you can’t beat the Elmo and Friends Gear Play set from PlaySkool. Each of the eight differently colored gear wheels features a smiling Sesame Street character, and can be removed, swapped, and even stacked, while babies can press Elmo’s nose to make the gears turn, with no batteries required. Babies love to chase things, and with the gorgeous colors and characters on the Lil’ Critters Roll and Discover Ball, who could blame them? Little hands can trigger animals and numbers learning by pressing the big star, and, as it’s motion activated, rolling, kicking, throwing, or shaking the soft ball will trigger sounds and phrases, too. If your little munchkin shows an aptitude for music, then the Munchkin Mozart Magic Cube is the perfect gift. This light up cube allows mini musicians to start the music, and then add or take away different instruments, such as the flute, violin, French horn, and the harp, for varying sounds and effects. Do you want a toy that grows as your child does? The Little Tikes EasyScore Basketball Set is height adjustable, and extends from 2 to 4 feet for long lasting use. Complete with three junior basketballs, the base can be filled with sand for stability, and features an oversized rim for frustration-free scoring. With so many things to do on the WolVol Activity Cube, your toddler won’t know which to tackle first! Will they sing into the microphone? Remove the cell phone to call their BFF? Or take it for a spin using the steering wheel with realistic sound effects? One thing’s for sure – they’ll never get bored. Sometimes the simplest of toys are best, and there’s nothing simpler than a ball. This set comes with four balls included, in red, yellow, green, and blue, as well as a hand pump to keep them inflated and ready for use. Phthalates and heavy metals-free, these balls are suitable for 1 year olds and over. Home is where the heart is, and your toddler will really ‘heart’ this home! Full of fun activities, this house comes with Mom, Dad, and Emma, and a host of fun features. Hit the alarm to flip Emma out of bed, flush the toilet, and peer inside the opening refrigerator and oven as they light up. Welcome to the jungle! This plush ‘tree house’ carrier is home to four magnificent animals, and each one comes with its own realistic sound. These little animals are soft and cuddly, and perfect for teaching your tot the sounds these ‘beasts’ make. Set includes a monkey, tiger, elephant, and the king himself – the lion. If you’re looking for a more practical gift for a 1 year old that’s eco-friendly, too, this feeding plate is an obvious choice. Made from sustainable bamboo, this sectioned plate comes with a handy suction cup underneath so the plate stays where it should, and a matching spoon. BPA-free, it’s ideal for weaning babies and toddlers. Your little star will be the star of the show when they get hold of the Mickey Mouse My First Microphone. With colorful flashing lights, this mic also plays nine songs and sound effects, including the much loved Hot Dog Dance, which tots can join in with, or they can sing their own songs by themselves. The perfect gift for toddlers, the Little Tikes First Slide makes a great addition to their indoor or outdoor play. The three foot long slide is just the right size for little thrill seekers, while the handy fold away design makes it a hit with parents, too. Suitable weight capacity: 60lbs. Your toddler doesn’t want to be wearing shoes indoors all the time, but still…hardwood floors can be a hazard as they get used to walking. These Tiny Captain Non-Skid socks solve the problem. With a strap across the top, these socks will stay put, while the silicone grips underneath make walking a doddle as they toddle. Babies will take to this baby float like a duck to water – with so much to see and do there’ll be no time to get nervous! The canopy keeps delicate skin safe from the sun, while the removable octopus keeps the six squeakable, stackable toys included within easy reach. Folds easily for storage. Kids will really be a-moo-sed with this adorable gift from VTech. The plush cow is perfect for cuddling, features an easy to grasp ring with light-up letters and numbers activities, and is equipped with more than 30 songs and phrases for huggably interactive fun. The variety of textures make this a great sensory toy, too. For coordination, or just for fun, this super cute purple octopus will make bath time or pool time a lot more exciting. The nautical-themed rings included can be tossed at the octopus as it floats and bobs about in a bid to hook them on the tentacles. BPA free for a splashing good time. Melissa and Doug, and Mickey Mouse…what a combination! Set to become a classic toy that can be passed down, this wooden toolbox includes a hammer and screwdriver, along with wooden screws and nails which can be fitted right into the side of the box. A great exercise in fine motor skills and introduction to DIY. Who do those dangling tootsies belong to? Your little foot detectives can take their investigations step by step as they try to discover whose feet are hanging down, and help poor old Crocodile to find his own. With crinkly feet and a squeaking nose, this machine washable cloth book will delight even the youngest readers. Bath time will be much more fun with these happy little fellas! Bobbing up and down in the water, little ones can play peek-a-boo with both the polar bear and the penguin as they hide in the bath bubbles, and, as they are watertight, there is no risk of mold and mildew forming. For a shape sorter with a difference, the Oombee Cube comes with its six shapes tethered to the game, so there is no risk of losing them. Attached by a colorful cord, each silicone shape fits snugly into its corresponding hole, making it perfect for curious kiddos who love to figure things out. Smart Stages Technology allows toys to adapt to every stage of your child’s development, and this Fisher-Price Laugh & Learn Mower does just that. Featuring over 30 songs and phrases, this colorful mower takes little ones through exploration, learning concepts such as numbers and opposites, and onto role playing and make believe. Perfect for little hands, this interactive Rhyme and Discover Book from VTech makes a great gift for 1 year olds who haven’t yet mastered the art of paper pages. This sturdy book has six pages, 3 light-up character tabs, 4 movable pieces, and 20 songs and sounds, including 7 much loved nursery rhymes. Toys needn’t cost the earth, and this red and yellow dump truck certainly won’t. Made entirely from 100% recycled plastic milk containers, this vehicle has no metal parts, and features a working dumper so that kids can make believe to their heart’s content. BPA, phthalates, and PVC-free for peace of mind. Totally kid-powered, this adorable giraffe ride on toy makes a beautiful gift for toddlers who like to be on the move. Suitable from the age of 12 months, this trike has a wide wheel base at the front, and an oversized wheel at the back, making for even more stability, and includes customizable spot decals. These fabulous fishies are just waiting to be caught by your toddler, as they bob about in the bath water. In three vibrant colors, these fish have a loop on the top which allows kids to catch them with their fishing rods. The perfect bath time toy, they’ll fall for it hook, line, and sinker. Using an internet connection, this cuddly little pup can be taught your child’s name, which she will learn, remember, and even spell out loud. With more than 15 personalizable activities, Violet also comes with dozens of songs and lullabies (via the app), with an optional 5, 10, or 15 minute setting. This cute little pup wants to go on walkies. As he is pulled along on his lead, this spotted sweetie will play songs and sounds as his legs move, or, when it’s time for a rest, his lead can be stored away and your tot can press the buttons to activate the learning content. This is one toy which will really ‘stand up’ to your toddler, or is it the other way around? Measuring more than 2 feet tall, this race rampway will be home to the thrills and spills, as the two Little People race their cars to the finish, triggering lights and sounds along the way. Whether you prefer pushing or pulling your little tikes along, the Little Tikes 2-in-1 Cozy Roadster can accommodate. The handle can be situated at the front or the back of this gorgeous car, which comes with a canopy, two drinks holders, and a zippered storage area to keep belongings safe. Suitable for indoor and outdoor use. Reach for the skies when choosing toys for your toddler, and add the Fisher-price Little People Helicopter to their collection. Press the pilot down in his seat to activate 8 fun helicopter sounds, music, and phrases, or spin the propellers and imagine the far away adventures your child will have. Recommended for ages 12m+. An oldie but goodie, the Little Tikes Rocking Horse has been a staple in children’s backyards for years. Suitable for ages 12 months to 3 years, this brilliant blue rocker comes with easy grip handles, and a high back seat to keep toddlers safe and secure. Ideal for both indoor and outdoor use. Elmo has been a favorite of Sesame Street fans for a long time, and now your child can learn their alphabet with Elmo by their side. Little ones can squeeze Elmo’s tummy to hear and join in with the alphabet song, or to activate 14 fun phrases to make them laugh. 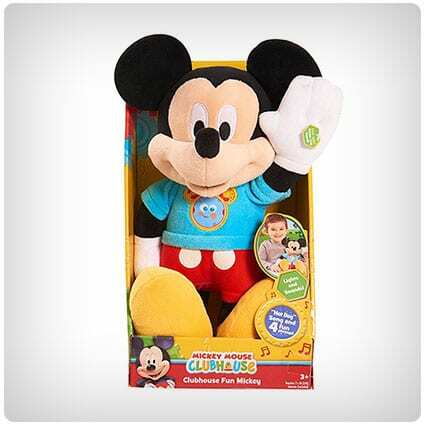 If your child is a fan of Mickey Mouse Clubhouse, they will adore having their very own plush Mickey Mouse, especially when they squeeze his hand and hear him sing their favorite song “Hot Dog Dance”. And that’s not all – Mickey also sings the Clubhouse song, and says many of his best loved phrases, too. This pet carrier does so much more than carry the adorable plush puppy that comes with it; it is packed with interactive features too. Open and close the door to learn about opposites, learn colors, shapes, and even pet care with the light up buttons, and even listen to more than 100 melodies, phrases, and songs. This is a little house with big learning opportunities, and it’s all there for your toddler to enjoy. There are more than 75 learning responses included, such as fun songs, routines, opposites, and stories, as well as pushing, sliding, and turning activities, which can be expanded even more when connected to the online LeapFrog Learning Path. Mirrors are fun enough for tiny tots, but when you add in learning and music, the possibilities are endless. With fun ‘cosmetics’, this Magical Music Mirror provides ample opportunities for greetings, opposites, and color learning, too. Open and close the compact to hear fun songs, or bat at the roller for cause and effect. Serve up fun and laughter with the Fisher-Price Laugh & Learn Sweet Manners Tea Set. With a light-up spout, the teapot also has a pressable teabag which activates lights, songs, and sounds, and shape sorter ‘treats’ for even further learning opportunities. Along with the tray, there are 10 play pieces for make believe and learning. Place your little tike in the Stroll ‘n’ Trike, and you’ll have a gift which grows with your child. Suitable from 9m, this superb Radio Flyer can be used as an infant trike, steering trike, learn-to-ride trike, and, finally, a classic trike, taking them right up to 5 years old. With removable canopy and drinks holder. This adorable playset is certainly fit for a princess – in fact, there’s one already inside! The castle carrier features touch and close fasteners, and comes with a crinkle princess doll, a magic mirror, a unicorn toy with sound, and a squeaker wand, just right for tiny hands to play with. Surface-washable for newborns and over. Now your little copycat can be just like Mommy or Daddy, with their very own steering wheel. The VTech Turn and Learn Driver has all the lights and sounds your child needs, including working ‘traffic lights’ signal lever, gear shifter, and a turning ignition key, along with 3 play modes and 60+ songs and sounds. Hooded towels are a must have when you have little ones, and this superb blog post shows you exactly how you can make your own. Using terry cloth, quilting cotton, and a little DIY knowhow, you can make these adorable towels as gifts for yourself or for an expectant mom. If you love to give homemade gifts, this blog post is for you. The Yoyo Plush Dog is brought to you courtesy of Craft Passion, and uses various fabrics and other sewing paraphernalia to produce this beautiful puppy, complete with floppy ears and lolling tongue. This DIY project is a 2-in-1, as it contains not one but two links to patterns needed to complete the gift – one for the plush alphabet, and another for the little drawstring bag to keep them in. Deceptively simple, these little letters each contain a magnet, making them a colorful alternative to plastic fridge magnets. Starting out as a humble sock, these adorable kangaroos make stunning gifts for both toddlers and older kids, and could even be personalized by using old clothing they’ve grown out of for the pouch and ears (making a great keepsake for Mom, too). With step by step instructions, these magnificent marsupials could soon be yours. For a DIY gift that no-one will believe you have made yourself, check out this tutorial from A Beautiful Mess. Looking far more complicated than it is, this large plush animal play mat requires only beginner skills and around one day to make, plus a short list of materials needed for the job. Don’t throw away that old bathrobe, turn it into an oh-so-cute bathrobe puppy plush instead. Using an old robe, stuffing, and of course a sewing machine, you can create this beautiful, soft friend that any child will love. Blog comes with free downloadable patterns for every step of the way. Head over to A Girl With a Glue Gun for some great inspiration for making a fabric dollhouse. Not so much a pattern as a guide, this blog post shows you how to make the basic shape, and then turn it into whatever dwelling your child’s dolls or toys need. Gorgeous, and totally customizable. 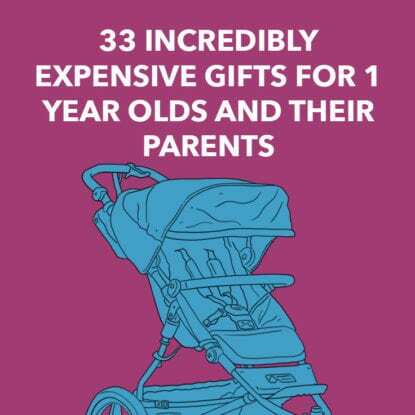 If you’re looking for gifts for 1 year olds, this list has you covered. Whether you’re looking for dollhouses, playsets for the garden, or maybe even a rocking horse, you’ll find it within this list. And because these gifts are slightly more expensive, you know you’re getting items of high quality. This comprehensive list of gifts for 1 year old toddlers range from items that ensure safe play time to educational and entertaining activities. You’ll discover a wide variety of products from non-slip robot boots for pretend play to colorful foam mats. Check out this extensive list of gifts for parents with 1 year olds to find out exactly what to get this year. Whether you are shopping for an occasion, or just because, this list will have something to suit their needs. This list is chock-full of unique 1 year old birthday gifts from building blocks to the universe in a night light. You’ll find a wide variety of wonderful items to surprise and please the little ones on special occasions. Your little one grows by leaps and bounds and with an abundance of plush, cuddly toys to help their learning, life is sweeter and somewhat simpler for you both. Wonderful gifts for 1 year olds help make that a reality.